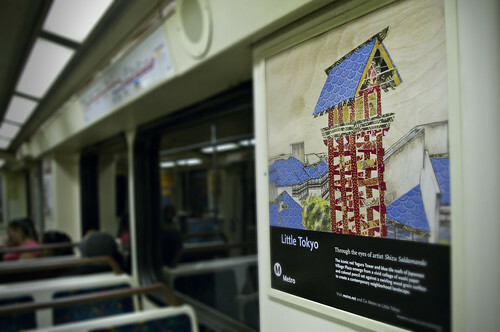 Little Tokyo by Shizu Saldamando, spotted on a Red Line train. Washi Paper, Colored Pencil, on Wood Panel. In October we introduced you to the newest addition in a series of posters that spotlight Metro accessible destinations, commissioned by Metro Creative Services. The artist, Shizu Saldamando, was kind enough to agree to an email interview with me to discuss her poster, her art and its place in Los Angeles transit. How did Metro approach you for the Little Tokyo poster project? Metro called me and asked if I would be willing to submit a design for their new Little Tokyo station. I think they had asked two other Japanese American artists as well. We were each given a stipend for the submission, and if our poster was chosen we’d be given an additional sum of money. So it was sort of like a private art contest of sorts. How did you come up with the concept for the poster? Is the Japanese Village Plaza a place you routinely visit? Yes, I go to Little Tokyo quite a lot for food, bars, art exhibits etc. I walked around the neighborhood taking photos and immediately knew I wanted to depict the Yagura Tower. I usually do portraits, but in this case I didn’t want to stereotype the people that would represent the neighborhood so I chose to do a cityscape instead. I know that I laugh at mustaches drawn on models in advertisements, so I decided the tower would be great alternative to depicting people. I contacted my friend Clement, who works at JANM (Japanese American National Museum), and he let me onto the roof of the old JANM offices, which are currently under construction, so that I could get a good view of the Village Plaza. If I had control over the title of the piece it would be called “View from JANM,” because that museum is such an important part of the neighborhood. I also use collage in my other work so adding the yuzen papers was a good way to make the composition more colorful. Your work has been described as “very L.A.”… what part of L.A. do you live in and what about L.A. inspires you? I live in the West LA/Santa Monica area, a block away from Sawtelle Blvd where there is a long history of Japanese American communities living there. My Japanese side of the family lived in the same neighborhood when they first moved from Chicago when my mother was 13, exactly 13 years after they were interned in Japanese American Internment camps. I am inspired mostly by people’s ability to forge new communities and subcultures no matter what mainstream culture dictates. I am drawn to people’s adaptability and rejection or re-contextualization of mainstream fashion, culture, and place. I’ve got ask: do you take public transit in Los Angeles? If so what do you think of it? If not, why? When I first moved to LA from San Francisco in 1996, I went to school at UCLA but got a job at Self-Help Graphics and Art in East L.A. I didn’t have a car then so I would take the bus from my apartment, catching the 7 Blue Bus on Sawtelle and then to the MTA bus depot on Pico to the 68 bus on Cesar Chavez by Union Station. It took me three hours each way by public transit but it was really nothing to me because I was so used to taking the bus everywhere in San Francisco. I think midway through, I started taking the 10 Blue Bus which went directly to Union Station on the freeway so that saved me a good 20 minutes. It was really interesting to see the changing demographics of each neighborhood especially riding the entire length of Pico Blvd. I would put on my Walkman and just sleep sometimes. Every so often some one would wake me up to make sure I didn’t miss my stop, but I assured them I was traveling to the end of the line. I also had short bright orange hair at the time so I got a lot of people trying to save my soul and help me find Jesus. Now I find myself taking Metro for social happenings, if I want to avoid being stuck in traffic. I also went on a Red Line pub crawl for a friend’s birthday where we took the metro to different bars around LA. It was very fun. You grew up in the Mission District of San Francisco. In a 2007 interview with Giant Robot magazine you mention a horrible experience taking the bus to the Sunset District. Care to expand? Did that experience shape your view of public transit? I think the horrible experience was really just me talking about high school in general. I dreaded going to school which happened to be in the Sunset District – an hour away by bus. The bus ride was okay, but the destination was nauseating. As far as my bus experiences in S.F., I saw a lot of pick pocketing and gang fights. Riding the bus in LA I don’t remember if I saw any fights, but I was on the bus a number of times when we got into an accident and had to get off the bus and catch another one because they had to do an accident report. Finally, in a post last month I wrote about the role art plays in creating a sense of place in a city. How do you feel about this? For example, your Little Tokyo poster is now a public artwork and seen by hundreds of thousands of people throughout the city and invariably becomes part of the fabric of L.A. How does this feel compared to having your artwork in a gallery or purchased by an individual? I think it is really great to have so many people view the work from all different backgrounds. It is a bit weird too, because usually I do portraits of people drinking or smoking and I had to kind of tone down and re-evaluate what kind of work to do for a public poster. I also like to think my work has political content, but I’m not sure how many people will actually realize my personal references within the piece – such as using wood to reference my Grandfather’s scrap wood sculptures he did in the internment camps, or the paper collage as another way to reference the various arts and crafts people did in the camps to pass the time. I view the poster as an homage not just to Little Tokyo and JANM, but to the crafty camp survivors in my own family who crafted art out of whatever they could find. To learn more about Shizu and her art, you can check out her artist website and her MySpace page. If you’d like to see her art out outside of trains and buses, she currently has three exhibitions in Guadalajara, Mexico and starting January 2nd and continuing throughout the month you will be able see her work at the far more Metro accessible Steve Turner Contemporary at LACMA.